Ok, so it’s not yet at the stage of an epidemic however there’s something that really concerns me about all the extreme vegan deliciousness becoming more and more accessible. For the most part it’s AWESOME. However there’s also another part. A part that has the potential to wreck havoc on health and happiness AND also all those hugely compelling statistics about vegans avoiding the lifestyle related illness’s that so many non-vegans are afflicted with. I honest predict there will be a flood of over weight and unhealthy vegans in the next decade or so. I really hope I’m wrong. I want to share how you can incorporate abundant vegan food joy into your lifestyle without any of the potential (processed crap-o-la) negative side affects. So what’s changed you might be asking? Well, instead of mediocre and minimal food options as a vegan now it’s possible to get ANYTHING you used to love as a non-vegan. Instead of having to prepare your own food from scratch – and from whole foods – it’s now possible to find vegan cheese, mayo, fakes meats, cupcakes. The snack / treat and takeaway options appear to be out-pacing the healthier whole food based and finer dining options. I’m not sure why. Perhaps like with their animal product based alternatives snacky-treaty-takeaway type food is faster and cheaper to produce? Or is it just an easier sell? One: AVOID Kidding Yourself That By Default Vegan is Healthy. Just because you’re escaping all the saturated fats, the hormones, the antibiotics and the high caloric density often found in animal products does not mean your alternative is necessarily healthy. 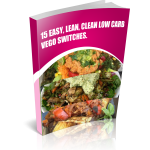 The simple approach is to focus primarily on one ingredient / whole foods. The types of foods that don’t even have a nutritional panel to scrutinise because they don’t come pre-packaged. The saying “shop around the fresh food perimeter rather than down the supermarket isles” still rings true as a vegan. It’s just now you’ll also want to avoid all those dead bodies and stolen excretions in the meat, fish and dairy sections. Special mention to the “Health Food” section of any store. Sure you’ll find some one ingredient staples that I highly recommend like: chia seeds, spirunlina and tahini… however the persuasive packaging here is just as misleading as in any other part of the store. If it’s selling you too hard that it’s, “Healthy! Low Fat! Sugar Free! Natural! Enhanced!” then please check the nutritional panel before believing the marketing. Generally the less ingredients the better. You certainly want to recognize all the ingredients. Also pay attention to serving size as that can be pretty deviously deceptive too. I have a rule to do my very best to include green veg with every main meal. It’s a lot easier than you might expect especially as a vegan. The more green you can work into you day the more filling fibre and essential micro-nutrients you’re fuelling your body with. This cuts cravings and also manoeuvres out some of the sneaky sugars and such stuff that we’ll address in Key #3. Here are a few options to help you get your green on! Think of your 3 favourite greens and then decide how to incorporate each of them into a main meal. Perhaps kale in a smoothie or less noticeably… zucchini. Broccoli in a salad. Brussels in a curry. Scout restaurant menus for the green sides that can be swapped in to replace something your don’t eat like cheese or bacon. Maybe a side of baby spinach or asparagus. Come up with a Go2 mega green meal to give your body on that occasionwhen you realise you’ve been under-greening a few meals in a row. If you’re not a natural fan of green veg I recommend trying a new veg or a new cooking method each week until you find the one/s you do like. There is such diversity and I’ve found that the right green can become a sort of gateway veg to help you acquire (at your own pace) a taste for others. Processed vegan food performs the exact same dastardly tricks on your body as processed non vegan food. It’s absolutely addictive. Food companies spend multi-millions to ensure that. You can eat a hell of a lot and still want more. Attempting portion control is near pointless. After demolishing enough to feel weak and guilty you’ll likely still feel hungry. If not now… then soon. And since you crave what you eat you’ll find yourself stuck in the cycle of consuming crap-o-la. I genuinely recommend abstinence over moderation for the vast majority of eaters. Unless you have a very low emotional attachment to food, trying to moderate something designed to addict you is just setting yourself up to struggle. It’s worth getting strategic to help yourself avoid processed crap-o-la. Bake home made kale, brussel (even collard) crisps instead of succumbing to over-priced and nutritionally void store bought stuff. Choose nuts (I still get roasted and sometimes even salted however NOT with added oil) over health bars and balls with unnecessary ingredients. Decide on your Go2 veg substitutes for those filler refined carbs that bulk up a meal cost effectively and all to easily will bulk up you! My favs include: Spiralised zucchini noodles / pasta. Cos lettuce taco shells. Portobello cap or sweet potato rounds for burger buns. Cauli-rice. Cauli-Crust pizza. Kale crisp nachos. I’m not advocating for a zero refined carb / processed food life! However, to be fit and healthy long term and of course To Escape The Junk Food Vegan Epidemic (!) I think it’s important to indulge in only the best of the your fav fake foods. Rather than resorting to fake foods out of convenience, or to be polite to instead to PLAN your most enjoyable indulgences guilt free. Four: EMBRACE Asking For Adjustments To The Menu. I noticed this (more so a lack of this) on the weekend when out with an awesome group of Vegan activists. We were at a pub that serves ALL VEGAN meals! That in it’s self is amazing however the meals – though delicious looking – really were also, Junk food. 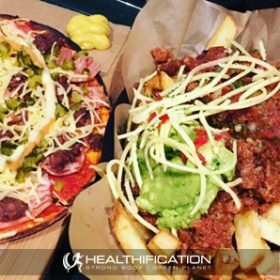 Burgers, pizza, loaded fries, parmigiana on fries and even chicken (not chicken) schnitty! That’s fine on occasion. However what if it’s happening all the time? I genuinely believe that in the same way it’s vital to request vegan meals at non-vegan restaurants to signify the demand it’s also important to request healthier upgrades at vegan restaurants to signify the demand. As long as you’re polite, respectful and appreciative I’ve never had an issue with this. You’re doing yourself a favour and you’re also doing the movement a favour. That might sound weird however as a personal trainer I can tell you 100% of my current clients that have made the move to eating plant based have done so for their health. Sure, I’d LOVE if they were doing it for the animals and leading a total vegan lifestyle however the reality is health sells for many people. It’s really important to maintain the legitimacy of the “Eating plant based / vegan is better for YOU” statement. In the end, whatever someones buy in to not eating animal products is – personal health, environmental impact / sustainability, global hunger – after a period of not contributing to the animal agriculture cycle of cruelty they become more open to the indisputable ethical argument. Perhaps it’s just easier to open your eyes to something you know you’re no longer contributing to. Refined carbs substitutes. Ask for a portobello cap or 2 instead of a burger bun. I did this at one restaurant and they were so impressed they added it as a menu option! High calorie density upgrades. Swap vegan cheese or bacon for avocado. Fibrous veg substitutes. Swap fries / wedges for extra salad or green veg. Side swaps. Just because it’s not listed as a side does not mean it’s not available as a side. Scan the menu to see what looks suitable. For example the listed sides might be: bacon, egg, hash brown, cheese and several different patties. Other potential sides include: roasted peppers, baby spinach, avocado, beetroot, pickled cucumber and of the patties I’d recommend the non fake meat version – in this instance it was a wholesome sounding brown rice, black bean, quinoa and veg burger pattie. Five: AVOID Snacks As Meals. This is something I see with both vegans and non vegans alike who struggle to stay fit and healthy long term. It used to be that our easy vegan snack options were more often one ingredient whole foods like: fruit, veg, nuts and seeds. However now…? Now, there’s an abundance of donuts, biscuits and cupcakes. Sure they are always going to be a better option to the versions chocka full of milk and butter however they’re also likely to be very high caloric density and as such easy to consume in excess. Really NOT satisfying due to a lack of bulk and fibre so you also end up consuming that full meal you thought you were skipping. And perhaps more because now you’re out of your routine / need to repeat that sugar hit. Six: EMBRACE Balanced / Proper Meals. The vegan version is built a little different to the meat eaters version as it does not revolve around a protein rich (cruelty rich) hunk of animal flesh. In contrast you’ll get your protein from a variety of plant sources in one meal. I recommend starting with fibrous veg: a huge generous serving of multi-coloured fibrous veg. Next add your plant based protein: perhaps legumes / beans, tofu or tempeh, maybe a combo of nuts / seeds. Finish with a satisfying good fat like: avocado, coconut oil or more nuts and seeds. Of course you’re also going to add all those flavour enhancers like herbs and spices and of course… nutritional yeast! 1: Rather Than One Main Event, focus on building your meals around fibrous veg, plant based protein and good fat. 2: Prioritise One Ingredient Whole Foods. 3: Buy Quality Produce and give it the same cooking, seasoning, marinating respect you gave meat. 4: Don’t Be Disheartened By A Recipe Flop! 5: You Might Have To Eat Larger Meals To Be Satisfied. 6: Find Creative Alternatives For Those Meals You Used To Love As A Meat Eater. Instagram is my favourite inspiration. Hemp seeds. 1 tablespoon contains 3gm of protein AND 1000 mg omega 3’s. Pumpkin seeds.1 tablespoon contains 3gm of protein AND 2 mg iron. Nutritional yeast. 1 heaped tablespoon contains 3gm of protein AND up to your daily requirement of B12. 8: When Eating Out Scan The Menu For Easy Additions To Your Meal. 9: The More Certain YOU Are Of Your Choices The More Accepting Your Loved Ones Will Be. 10: Everything Counts. Move at your own pace. Know there is not such thing as failure or a “bad vegan” AND do it for YOU at the right time for you. That brings us to the end of todays show. Is there anything you’d love me to cover in an up coming show? Please let me know. I’d love to hear from you via the show notes or even better via an iTunes review. Those little reviews absolutely 100% make my day. If you liked ‘6 Keys To Escape The Junk Food Vegan Epidemic‘ you’ll also like: How To Avoid becoming A Junk Food Vegan and Becoming Vegan / Vego: 3 Tips To Make It Easier On Yourself And Those Around You.